Responsive launching soon page with a bright color scheme for new social application Startup, Hudyl. 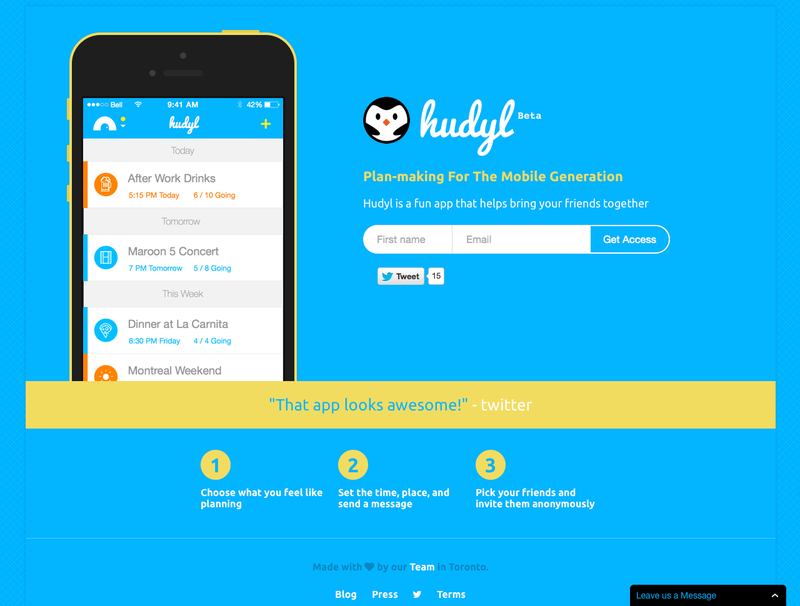 Hudyl is a little app with a big goal - to bring the world a little bit closer. We’re trying to make it easier for people to put themselves out there by building a tool to let them quickly & anonymously send invites for the everyday things in life. The goal of the Hudyl website is to make an emotional, and functional appeal to viewers to sign up for an invitation to our beta so they can better connect with their friends. While some websites put a sign-up form front & centre on the site to improve conversions, we wanted the reader to get to know us a little bit before deciding if Hudyl could fit into their life. The site was built using Bootstrap to be responsive and make things easier on our end while we focus building out the product.